What can be said? Horrific disaster. Glen Reynolds at Instapundit seems to have the links to the charities and organizations that need support for relief efforts. We just mentioned fuel costs. This will aggravate that as significant refinery capacity is down and an already stressed production of gasoline has been severly limited. But the human tragedy puts any concern about fuel cost in an appropriate perspective. This is where we come together to grieve, to support each other, and to do what we can to help others get back on their feet. There has been much moaning about the recent spike in the cost of gasoline. Hurricane Katrina won’t help much as it hit the gulf oil rigs and refineries hard. With all of this there is a real need to make sure your perspective is properly placed and to not get panicked. Here is what one Texan did when he plotted how much he paid for each gallon of gas he purchased since 1979. 996 fill-ups are represented and the actual price paid, the inflation price, and US average prices are shown in a time series graph. What it shows is that we aren’t quite yet in the situation our parents were in the 80’s when it comes to fuel costs. This is the week — and weekend — of ribs. The 17th Annual Best in the West Nugget Rib Cook Off kicks off Thursday on Victorian Square. More than 148,000 pounds of St. Louis-style ribs will be served up to more than 300,000 visitors — both local residents and visitors — at the event that runs through Labor Day, Monday, Sept. 5. For more information, call John Ascuaga’s Nugget at 356-3300, 1-800-648-1177 or log on to www.nuggetribcookoff.com. So, if you aren’t doing Burning Man or something else, hit Sparks and get your fill of the world’s best BBQ ribs. In the local Reno news on 30 August there are three reports of fatal car crashes. KTVN Reports “John Davidsen was traveling westbound when his pick-up truck crossed into eastbound lanes and collided with a large box truck” on 50 alt. – not wearing a seatbelt and DoA at the hospital. “On Kietzke Lane near Automotive Way. Reno police say his car swerved into oncoming traffic and slammed into another car. Note that in all three of these tragic accidents the cause was a failure to maintain lane discipline. Despite the hype most often heard, none of these was a speed caused crash. In every crash, some survived so speed was obviously not the only factor in causing injury. So take care to maintain your lane and stay alert. Keep an eye on the other driver who may drift into your lane. Keep your seat belts tight and be prepared. Bob Dole writes “Illinois readers should pay special attention to an official newly-uncovered study that the UK government never wanted you to see. It shows that injury accidents increased 31 percent when speed cameras were used on freeways, and they increased 55 percent when used in freeway work zones. When the researchers who were commissioned to study the effects of cameras in construction zones came up with these results, the UK government did everything in its power to prevent the data from ever seeing the light of day. After all, they make about 700 million pounds (a billion US dollars) yearly from the machines. Illinois is about to implement its own work zone speed camera program, “to reduce accidents and save lives.” I’m sure the last thing on the mind of Illinois bureaucrats is all the $375 first offense, $1000 second offense citations it will generate.” Update: Some good points in the comments ripping this study apart. It is worth noting, by the way, that the source of it, TheNewspaper, is based on the idea of stopping redlight and speed cameras. It sounds like they’re misquoting this study and misreading it on purpose. Speed is one of those topics that generates a lot of heat and very little light. The first sign you see on entering Nevada is usually a “double in construction zones” which refers to the harsh penalties for exceeding speed limits in the many construction zones even if there is no construction in process. The start of school also has a lot of press from police about the dangers of speeding in school zones and how many people they have nabbed. The problem is that speed limits are rarely set according to the criteria that are supposed to be used to determine an appropriate limit and that there are often conditions, such as construction or congestion, that make the posted limit an absurdity. This means that enforcement is often arbitrary and biased by revenue considerations. That leads to an unsafe driver attitude towards enforcement and cynicism about authorities and safety. Observe posted speed limits but also consider conditions and the fact that your rig, your RV, is not the typical vehicle considered for most traffic warning signs. Take the appropriate precautions, try to avoid irritating others, and drive safe. If you want to avoid the Gardnerville and Carson City traffic on US 395 you can take a bit of detour from Bridgeport to Yerrington to Fernley. 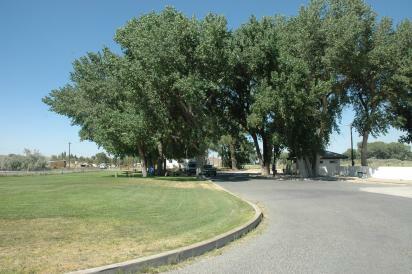 There are a couple of nice NDOT roadside parks along the way. On Rt 339 just outside Yerrington across the road from a commercial scales and next to a road maintenance yard is this one. It has a dump station, too. 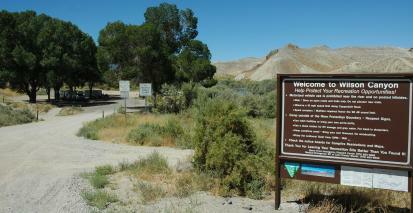 Note that NDOT roadside parks allow for an 18 hour stop. No fees. There are several Twin Lakes which means finding the SNU rally site can end up with false leads. The one to look for this weekend is out of Bridgeport on Robinson Creek. This isn’t the Mammoth Lakes Twin Lakes! That’s just over the hill. Here are some links to peruse. The National Championship Air Races and Air Show, 14 – 18 September, 2005, Reno Stead Field, Reno, NV, USA. SF Gate has a story about people who are getting prepared for the 2005 Burning Man event (Aug 29 – Sept 5). It ends with a list of “must-haves” and “nice-to-haves” that cover the basics of dry camping in the desert for a week. Burning Man is a bit out there but it does provide a good example of a well managed event that has thousands of people out on the playa for several days. If you are putting together a rally, compare your information to what is available at Preparing for Burning Man 2005 or Heloise of the Playa or Health and Safety. Nevada had been a state for less than ten years and Reno was a newly established railroad town when what would become the Nevada State Fair was first held on a warm Fall afternoon in 1874. More information is at Reno.Com or Things to do, Nevada. Photos can be seen at the USDA site. The Stover’s 1973 Argosy provides an example of Airstream’s early experiments with metal technologies and other things. See the photo gallery of a well traveled 1978 Sovereign. This one had disk brakes run through a pneumatic system using tow vehicle vacuum as the power source. You can also see the ‘elephant ears’ of a factory fix to rear end separation between the frame and the shell. USA Today provides the answers to a number of questions that are summer related. Why do bees buzz? Why do mosquitoes bite? How does sunblock work? Why does cut grass smell? Short answers to some interesting questions will get you prepared for the next trivia contest and maybe even answer some burning question that has bugged you. We surmised that the mantis ran the hummer through and dangled its full weight on its foreleg while he consumed the flesh of the hummingbird from the abdomen. After he had his fill, the mantis gave his foreleg several swift jerks and freed his leg. This site looks like it might be a good resource for those interested in observing nature around the campsite. They are selling magazine subscriptions but still appear to have a lot of resources and links of interest to birders. As dog owners, it is only right to pick up after your dog. That means a problem of carrying plastic bags and paraphanalia to manage the task and some means to carry the result to a disposal site. Poopsadaisy for Dogs at Clever Pet Products is one possible solution (about $19). It is a small pack to mount on your dog’s collar so they can carry the supplies and refuse. The next time the group gathers around the campfire, you’ll have to pull out one of these electric marshmallow toasters. instead of spearing the fluffy sugary lumps with a dirty stick and twiddling them awkwardly over the coals, we’ve encountered a new high-tech way to get multiple marshmallows cooked to perfection. Sayonara manky old twig, hello handheld rotisserie-style electric marshmallow toaster! The recent surge in fuel prices has some people near panic. Yet, when adjusted for inflation, the price of motor fuels in the U.S. is still quite within historic ranges. This does not mean that fuel efficiency is of no concern. RV’s are big and heavy and this means they burn a lot of fuel getting from here to there. Less money on fuel means more for something else. Tara Baukus Mello describes Top 10 Tips for Improving Your Fuel Economy at Edmunds.com. Many are good advice for the RV enthusiast but most are for the typical around town and commute driver. After making sure your rig is properly maintained and in optimum mechanical condition, it is eggshell driving that conserves fuel. This means driving like you have eggs taped between your feet and the pedals – No hard braking and no hard acceleration. Eggshell driving is one reason why experienced drivers can often get better gas milage without using cruise control. If foot feel isn’t enough and you like a gauge, then install a vacuum gauge for gas engines or an exhaust temperature gauge for a diesel engine. Lower readings on these gauges means better fuel economy. Speed is also an issue although not as big an issue as some think. Generally slower speeds will be more fuel efficient. But gearing, tires, and motor tend to complicate things. Dropping from 65 to 55 might save a couple of percent on fuel but then again it might not. Weight is another bogyman in fuel efficiency. Unless you are doing a lot of starts and stops and choosing routes that are almost all grades, what you can do with saving weight won’t make much difference in fuel use. A modest trailer rig weighs five to ten tons and all you can reasonably change is maybe a half ton so the ratio of weight change is small. And air resistance is more important than rolling resistance in fuel efficiency when heading on down the road. Perhaps one of the most significant things you can do to improve fuel efficiency in in your choice of rig. There have been significant improvements in engine and transmission efficiencies in the last few years. Diesel may be a consideration as well. But the $40k to replace a paid for older truck worth maybe $5k means $35k for fuel and some increased maintenance. That could translate into 120k miles of fuel in the price difference. So consider your trade-offs carefully. The Organized Home may have some ideas for you to help keep clutter under control and make a more livable space. A top National Weather Service expert in Phoenix will investigate a powerful lightning strike that “sounded like dynamite exploding,” damaging 13 homes in central Mesa on Tuesday afternoon. The cat was hiding under the bed and the vet says its OK, though. Joe Rao has an interesting night sky column, Doorstep Astronomy: The Celestial Medicine Man. He talks about a constellation on the Zodiac that is between Scorpius and Sagittarius named Ophiuchus. He also defines the difference between a constellation and an asterism and provides some interesting historical trivia about Poniatowski’s Bull. By the way, did you get out and watch the meteors last night?